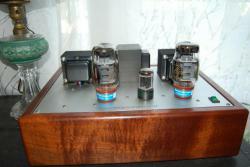 Up for sale is an ampsandsound Big Ben tube amplifier. 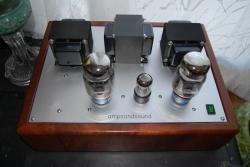 It was purchased about 5 months ago, but I've since upgraded to a pair of NOSValves VRD monoblocks. 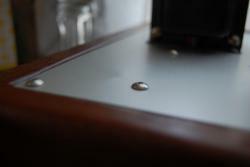 The amp has a small blemish on the metal that you can kind of see from the photo. It's really not bad and was sold to me that way by Justin as B-Stock (hence the lowish price). Price includes shipping. It's a great amp, but I need to make room for the VRD's. What are the specs on these? I can't find the info on the ampsandsounds website. I'll have to get back to you on that. I know it's single ended and cathode biased. I believe it's very similar to the Bigger Ben on the website except this one isn't tube rectified. The draw of single ended amps has always been realism and engagement. The Big Ben is setup for clarity over crazy power. Parts selection was crucial during this build and each was chosen not for price, but for quality of synergy between parts. Rectification is Solid State for cool running and reliable performance, again always over spec’d. The amp is configured for ultra linear operation allowing great power output and minimal use of feedback. The sonic signature is deep rich bass, and soundstage to die for. Big Ben makes use of an over specified, extremely stiff power supply. The power supply is significantly larger than needed for primary filtering. In the early days of tube amps, chokes were easier to come by than caps and more reliable. As such, large chokes were utilized for primary filtering. As capacitor production gained reliability and costs lowered, cap filtering and smaller chokes became the norm. In a single ended designs, a regulated ultra quiet power supply is very important. Using a 5 Henry choke is expensive and large, but yields significant improvements in reduction of DC ripple. Output transformers are over spec’d and ultra high quality. We consider the output transformer as important as any other design choice. When buying any tube amp, the weight of output transformer can be directly proportional to the quality of sound. In general, larger outputs have largers cores which are less prone to saturation and have higher inductance. Larger cores and greater inductances allows the transformer to carry a low-end signal with minimal distortion. These transformers are bench tested to perform down to 20hz and up to 20khz. Even if your speakers only go to 50hz like a LS3/5a having an amp with can drive that low impedence signal is pivotal in creating the whole sound stage. Well paired speakers: Big Ben pairs well with most speakers 84db and above. Big Ben is ultra-quiet allowing use of full range or horn loaded speakers with efficiency above 100db. Speakers which can go down cleanly to 30hz really bring out the very best of the amp. 1. DIY Econowaves (12” and a 1” compression driver; great sounding 95db efficient). 2. Klipsch horn loaded anything… Preference to Cornscala’s; (15” woofer with elliptical horn/2” compression driver and horn loaded tweeter with 1” compression driver 98db efficient and able to shake the house). 3. DIY/ampsandsound bass reflex cab ~.25cu ft with Fostex 103 4” or audio nirvana 4” ~approximately 89db efficiency. Probably not for a big room, but gives low 50hz response in a crazy small cabinet. Wonderful for near field, offices or small rooms. The amp is compatible with all 6l6 family tubes, including 6l6GC, KT66, KT77, KT88, KT90, and EL34s. The driver tube is a 6SL7. My personal favorite currently is new EH6550 paired with new production Tungsol 6SL7 driver. For new old stock tubes, I like RCA 6L6GC clear tops. wow. that amp is a beauty. Thanks! Justin does great work. Just for reference sake....I have one of Justin's Stereo 15 Special Editions. I was planning on selling it, as I had (thought) I was going to move on to something else...however, after I took it to the Hope gathering and played it for quite a number of folks, got so many fantastic comments and really did a bit of critical listening to the unit with a bunch of different material, I decided it was too good to give up, so I'm keeping it. I think that's a pretty good testimonial....Justin does great work, and is a great person as well. Thanks, guys. If I could afford to / had the room to keep it, I would. So, I might of missed it, but what is the rough wattage output per channel on this amp. All depends on what tubes you run. 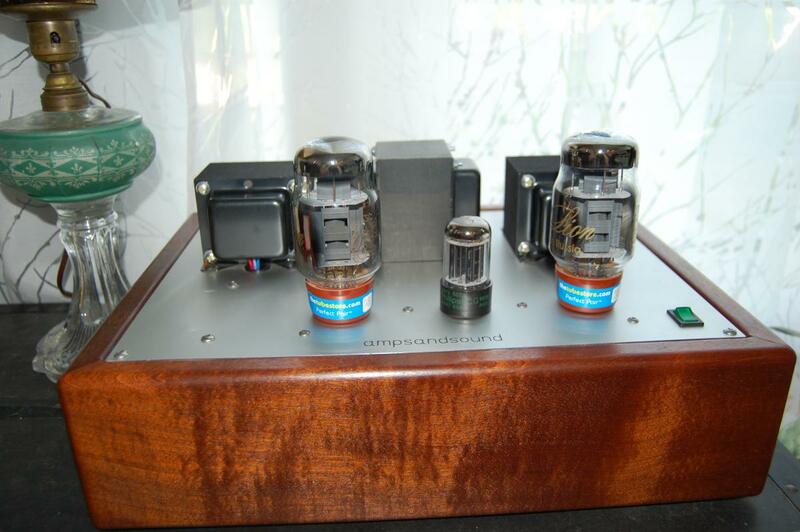 Thats said, I run the amp in Triode so its lower output then in pentode mode. 6L6GCs ~ 4watts per ch. EL34s ~ 5watts per ch. KT88 7-8 watts per ch. All of my amps are extreemly quite and very wide bandwidth. Hope this helps. Justin, if still watching this, you said you run the amp in triode. does this mean it can be toggled between modes, or did you mean it's built/wired in the triode mode? Only wired for triode. Ive tried pentode and not the biggest fan. Warm but not low enough distortion. Hope you love your amp.